- What and Who is A Podcaster? What and Who is A Podcaster? Is a person who cares about connecting, helping and sharing a passion with others. Is willing to put themselves out there and take a risk to find success at some level in the hard yet fun journey of being a content creator, leader, facilitator of others success and communicator that brings people together. - We got a show PROMO this past week and wanted to play them here. 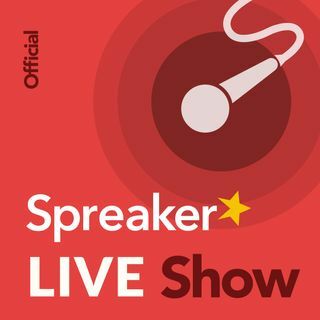 Thank you for the work you put into the Spreaker Live Show every week. Since I found out about it about a year ago, I don't think I've missed more than a few episodes, and the information on the Spreaker platform and the industry in general has been great. You have asked for a few promos for shows that use the Spreaker platform, and I have, well, a lot currently. I am attaching a :30 and a :60 promo for my Weekly News & Current Event Review Show, and hope one makes the cut for a shoutout soon. - More Interviews of Spreaker Podcasters, External Distribution Platforms, Other Leaders in the Podcasting Industry on topics that you need to know about. - Alex will still be with us also for the first part of every show and you will have the choice to listen to each of the 2 interview conversations we will have in the last half of the show each week. Panel Title: Is Podcasting Headed Towards Crazy Change? Description: We will take a look at why it seems the podcasting market seems a little nuts these days. We will explore why 2019 will be transformational year in podcasting. Panelists will cover every major facet of the podcasting space related to content, platforms, audience, metrics and monetization to decode the wild market ride we are on. We chose a name that we knew no one would have. We had created our web site, Facebook page, Twitter and You Tube accounts two and a half weeks ahead of our first launch date on Spreaker. We started our show based on what we did in television 20 years prior. You are great solo, but also great with a co-host and/or guest. You are very knowledgeable, flexible and very compelling. Thank You! I am excited to turn another page on the format too! I've been wanting to start a podcast for a long time I even have a plan with spreaker but have never used it. I been really working here lately to get a show going but am kind of stuck on making sure I have content. I have been binge listening to your show today and have gotten some good information. Thank you, so hopefully I will have a show up on spreaker soon. I'm excited about your new format! Thank you for listening to the Live show this week as I go solo.